Global Woman P.E.A.C.E. Foundation (GWPF) wanted to show recognition, respect and appreciation to people who dedicate their time to the campaign against female genital mutilation (FGM), and other injustices against women and girls. 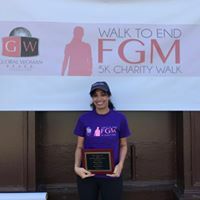 Therefore in October 2015 at the 2nd Walk To End FGM (#walk2endfgm) the organization recognized and awarded several women, including Martha Leslie Allen, Shelby Quast, Aissata Camara, Dr. Marci Bowers, Jaha Dukureh and others for their dedicated work. The recognition gesture became an annual culture for GWPF; in 2016 some awardees traveled from as far as Switzerland, Belgium, and the U.K. to Washington, D.C. in the U.S. to receive their awards. Then in 2017 several of the awardees traveled from France, Somaliland, and Germany to be recognized. Now in 2018 the organization expects some of their awardees from Egypt, the U.K., Iran and various U.S. cities. In 2016 GWPF awarded the first man, Artist Godfrey Williams-Okorodus for using this art work to advocate against FGM. 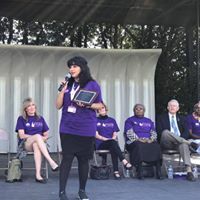 In the same year, the Global Woman Awards recognized the first student, Amani DeShield for introducing the campaign against FGM to her Middle School in Hagerstown, Maryland in the U.S. This category, Student Ambassador was created to encourage students and young people to become involved in the campaign against FGM, while raising awareness about FGM among their peers. The second man, Virginia State Senator Richard H. Black was recognized last year for his diligence in criminalizing FGM in his state. Last year in 2017, the organization also created a special Nominating Committee, Chaired by their Vice President, Amie Jallah to nominate and cast votes for the award recipients. The Nominating Committee is comprised of award recipients from previous years. The committee is responsible for vetting and nominating individuals who have exemplified performance in the campaign against FGM. Starting this year, the Global Woman Awards will recognize and award their recipients on Friday evening, October 26, 2018. In previous years the awards were given out on the day of the Walk To End FGM (#walk2endfgm). However the organization and the Nominating Committee decided to turn it into a two-day event. One of the deciding factors was to allow the awardees time to give brief speeches upon receiving their awards. In previous years the awardees were rushed because the organization needed to begin the walk timely. The award night is a red carpet event programmed into arrivals on the red carpet, a buffet supper, a silent auction, the screening of a film trailer, In the Name of Your Daughter, awards, and a brief presentation of the work GWPF does in the community to advocate against FGM. The Milken Institute of Public Health at George Washington University is collaborating with GWPF by accommodating the Global Woman Awards at their auditorium. The red carpet arrival begins at 6:30pm EST. Media – This award recipient must use his/her work in the Media through reporting in print, television, radio or social media to help raise awareness about FGM to be eligible to receive the award in the Media Category. Literary – By writing books, (fiction or nonfiction) textbooks, poetry or any literary work to educate, inform, influence the public and enforce the law about or against FGM; this recipient should have done at least one of these requirements to be eligible to receive the award in the Literary Category. Legal – An attorney who works with immigrant women and girls of FGM experience is eligible for this award. Also, an attorney rendering other legal services to help prevent women and girls from FGM would be eligible to receive the award in the Legal Category. Medical / Health – A medical personnel such as an obstetrician/gynecologist, psychologist, psychoanalyst, nurse, mental health professional, surgeon, etc. who has worked with women and girls that have experienced FGM will be eligible to receive the award in the Medical Category. Survivor Activist – A woman who has experienced FGM, and has taken her own experience to help other women and girls; by either starting her own campaign against the practice of FGM or working with other organizations and campaigns will be eligible to receive the award in the Survivor Activist Category. Advocacy – An advocate or activist who works against FGM and is making a difference in the lives of women and girls meets the criteria for this category. Political – This award recipient does not have to be a politician. He/she must have helped introduce FGM into law, advocated against FGM in a nation’s government, parliament or congress to be eligible for this award. Education / Training – A teacher, trainer, professor, counselor, or caretaker who trains and educates the general public about FGM is eligible for an award in this category. Student Ambassador – A middle school, secondary school or university student who has done something to help raise awareness among his/her peers and within his/her school about FGM is eligible to receive the award in the Student Ambassador Category. Person of the Year – This category is a new addition this year. There are people who do a great deal to protect girls and women from various types of violence, including FGM but they might not be eligible for any of the other 9 categories. This individual must be exceptional in his/her contribution to the campaign against FGM and/or other gender based violence. To learn more about those who have been nominated for awards this year, please visit http://www.globalwomanpeacefoundation.org and click on “Register to Walk”, and select “2018 Nominees”. During your visit to the site, won’t you stop by the Registration page and register to join GWPF for next month’s 2-day event?